To control a broad spectrum of challenging pests, you should expect a solution that delivers consistent, proven results. For more than 20 years, Pest Management Professionals (PMPs) have put their trust in Demand® CS insecticide from Syngenta to provide immediate and long-lasting control of more than 30 different pests including mosquitoes, fleas ticks, scorpions and spiders. 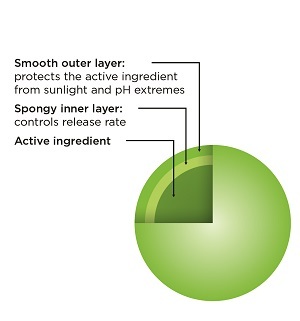 Demand CS features the power of iCAP™ technology, a unique formulation developed by Syngenta. The active ingredient (a.i.) in Demand CS, lambda-cyhalothrin, is encapsulated within the spongy inner structure, protected by a smooth outer shell. Over time, the a.i. is released through the capsule wall. The mix of different-sized microcapsules provides a steady release to offer immediate and extended control, from Day 1 up to as many as 90 days. This means you can expect Demand CS to work continually between service visits – whether those are every 30, 60 or 90 days - reducing the potential for early retreatments. iCAP microcaps are also designed to be picked up by insects as they crawl over treated surfaces. This allows the active ingredient to control insects on contact and be transferred to other insects for thorough control of the target pest population. Syngenta offers SecureChoice™ assurance programs for guaranteed control of pests like mosquitoes, fleas, ticks, scorpions and spiders. These programs rely on Demand CS to confidently assure the results from treatment protocols targeted to control these important pests. For more information about SecureChoice assurance programs, visit www.SyngentaPMP.com/SecureChoice. Demand CS is recommended for controlling mosquitoes, fleas, ticks, scorpions and spiders as part of each SecureChoice assurance program treatment protocol. With a proven track record of success, Demand CS continues to give PMPs immediate and residual results for their pest control needs. For more information, visit www.SyngentaPMP.com/DemandCS. ©2017 Syngenta. Important: Always read and follow label instructions. Some products may not be registered for sale or use in all states or counties and/or may have state-specific use requirements. Please check with your local extension service to ensure registration and proper use. Demand®, For Life Uninterrupted™, iCAP™, SecureChoice™ and the Syngenta logo are trademarks of a Syngenta Group Company. Syngenta Customer Center: 1-866-SYNGENT(A)(796-4368).